Microsoft is implementing self-service refunds for Xbox One and Windows 10 gamers, but there are some caveats. Microsoft's Xbox One is now the only console that supports refunds on digital purchases. The new program is being called "self-service refunds," and was announced yesterday through a post on the console's Alpha preview. Microsoft has confirmed that refunds will soon be available to all Xbox One and Windows Store customers. The system bears a marked resemblance to Steam's refund system. To request a refund, all you have to do is head over to your account page on Microsoft.com and sign in. Once you're in, click "Payment & Billing" on the menu, and then click on "Order History." Find the game, and click "Request a Refund." Of course, this won't work on every purchase. There are a number of restrictions on just which games can be refunded. Games and apps are only eligible for refunds if it's with 14 days of purchase, and you have less than two hours of playtime. It must have been at least one day since the game or app released, and DLC, season passes, and add-ons cannot be refunded. There are also certain Windows 10 apps that "may not be eligible." You must also have downloaded and launched the game or app at least once to request a refund. Microsoft also says that it "reserves the right to block access for users who abuse self-service refunds." This new refund system should be live for all users soon, with some reporting that it's already showing up. 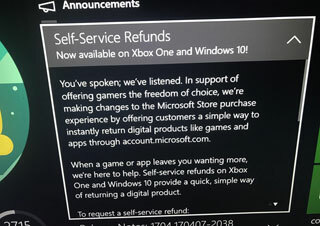 That said, Microsoft's own FAQ still says that "You can't return a digital game and receive a refund or credit." It will be interesting to see if Microsoft's move triggers a similar program from Sony and/or Nintendo. In the wake of the lawsuits faced by Steam over not offering refunds, it wouldn't be surprising to see refunds on all digital platforms in the near future.